NC Masonry homes – Passive solar designed homes utilizing mass and natural air flow with light weight block and concreted construction. Envelope house – Passive solar design utilizing natural air flow within a double insulated envelope. Carboro YMCA – Large bank of roof mounted solar panels to heat swimming pool water. RavenCroft School – Large bank of roof mounted solar panels to heat swimming pool water. Nicklaus Residence – Passive/Active solar home for Solar/Energy driven architect. (Served several terms as President of National Solar Foundation). Expertise in obtaining government grants. New single family homes – Utilized most cost effective methods to conserve energy in all homes built for the past 30 years. Professional Type Passive solar built in 1978. This is an envelope house, an insulated structure within another insulated shell. Note large pecan trees that shade the sun room from the hot Oklahoma sun, but loose leaves in winter to welcome the sun’s warmth. Energy bills are $78/month for this 2800 square foot house. Integrity Builders is committed to conserving resources with the use of cost effective materials and practices. 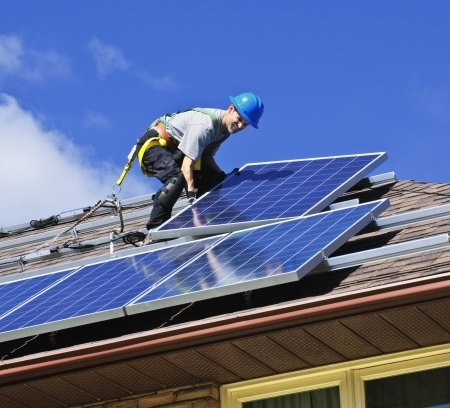 Want to know more about Solar? Learn how you can save and how pain-free the process can be.